Celebrating the life of Rayburn B Chambers, Sr.
Be the first to share your favorite memory, photo or story of Rayburn. This memorial page is dedicated for family, friends and future generations to celebrate the life of their loved one. Obituary for Rayburn B Chambers, Sr.
Rayburn B. 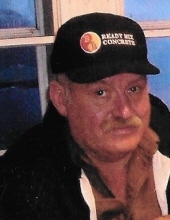 Chambers, Sr., 63, of Oneonta, passed away unexpectedly at his home on November 3, 2018. Ray was born on November 24, 1954 in New Berlin and was a son of the late Charles and Lucille (Mudge) Chambers. Ray was most notably known for his hard work ethic. He was employed for many years at the Kraft plant in South Edmeston where he eventually retired from. He was an avid outdoorsman that enjoyed hunting. He especially enjoyed the hunting trips that he took with his brother in Colorado. Ray is survived by his children, Christina (Dave Gregory) White and Ray Jr. (Jessica) Chambers; grandchildren, Devin, David, Ashley, Kristen and Lindsey; great-grandchildren, Savannah and Addyson; brother, Marvin Chambers; sisters, Jodie (Jeorge) Mills and Charlotte (Charles) McMullin and several nieces, nephews and cousins. Ray Sr. will always be remembered by the stories of his adventurous life being told and retold to all who crossed his path in life, and the laughter that will come from hearing those stories will continually bring us joy as he brought to everyone’s life that he touched. A graveside memorial service will be held on Saturday Nov. 10th at 2PM in Edmeston Union Cemetery. Funeral arrangements have been trusted to the Johnston Funeral Home in Morris. "Email Address" would like to share the life celebration of Rayburn B Chambers, Sr.. Click on the "link" to go to share a favorite memory or leave a condolence message for the family.